You may have seen my recent e.l.f haul post (here) where I purchased a lot of e.l.f makeup during their 60% off sale which was amazing! 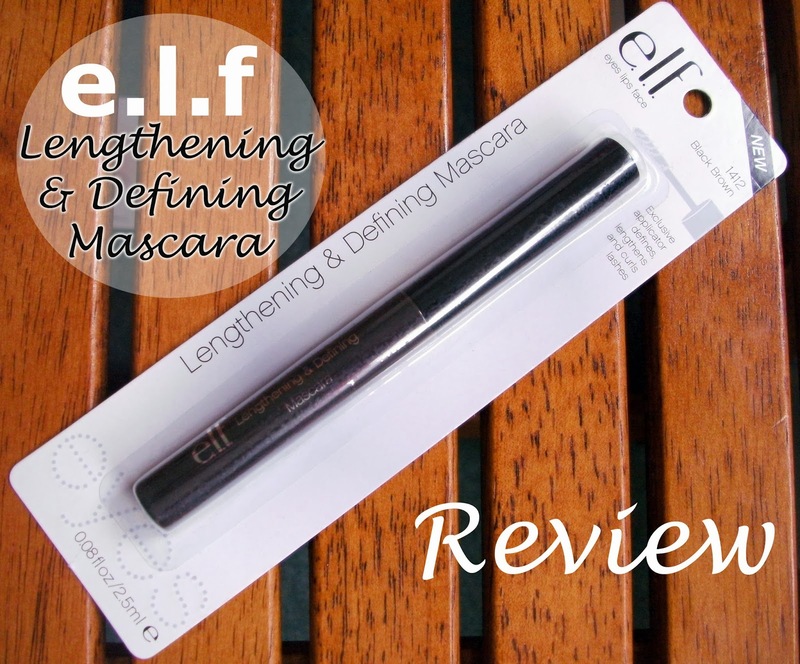 This e.l.f lengthening and defining mascara was one of the items that I cheekily added to my basket. It is from the basic e.l.f line and usually costs £1.50 but during the 60% off sale, this only set me back a mere £0.60 which I think was quite a good bargain! The e.l.f lengthening and defining mascara is available in 2 colours: Brown Black and Black. I chose mine in the shade brown black as I have been using only black mascaras for a while now and I fancied a bit of a change! The packaging is very compact and the design is simple yet still attractive. Inside is 2.5 ml of product which is significantly less than the average mascara which usually contain between 7 ml and 11 ml of product. It is available from the e.l.f website here. This mascara claims to give thicker, fuller and longer lashes without clumping, smudging or flaking. I would say that it pretty much lives up to those claims which is quite impressive! But there are a few downsides to using this mascara which are potentially deal breakers for me. The formula is so quick drying it can be difficult to go in over the top and add more layers because once it dries the lashes become quite stiff and inflexible. The wand is pretty basic and doesn't do much to separate lashes, especially after the first layer has been applied. This mascara was wonderful to use for about the first 10 - 14 days but then it really started to dry out so I added a little contact lens solution to revive it and got a bit more use out of it but it's pretty much completely dried up again now! So this mascara does not last very long in my experience and it's a shame that it dries up before it's used up! Pros: Super inexpensive, definitely adds length and volume to lashes, doesn't clump, doesn't smudge on me, quick drying formula, is a compact size for travelling. Cons: Tiny amount of product, doesn't last long, dries out quickly, e.l.f products are only available online. Would I repurchase? No, I don't think I would do. e.l.f currently sell 15 different types of mascara and I'd prefer to try another variety of e.l.f mascara over this one again.